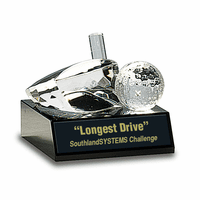 FEATURES/SPECS When you are planning a tournament at your local country club, a charity golf event, or your community corporate team annual golf tournament, one of the most important details is the trophies you will present to the winners! 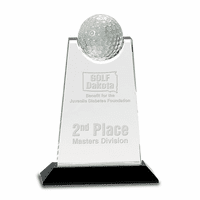 They have to be elegant, and beautifully inscribed with the name of the tournament, year and possibly a logo. They have to be unique and sophisticated. This golf award is all of that. 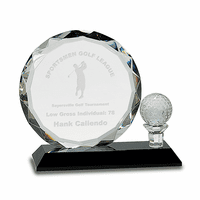 A clear crystal golf ball, carved in exact detail, rests on the edge of a crystal wave. It could be called a slice, but we don't want to go there. 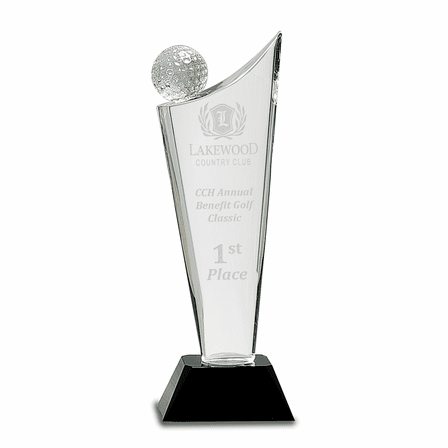 The wave rests on a jet black crystal pedestal base, and the front face is perfect for your tournament competition or country club name, date and logo. The text and logo are included in the price, and we package the trophy for you in a beautiful gift box for presentation and storage. 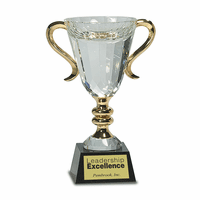 At the Executive Gift Shoppe, we know it's all about the details, and that's why we know you'll love this trophy, so we are happy to give you our Satisfaction and Performance Guarantee!